Celtic punk rock’n’roll, with lashings of mandolin, tin whistle and accordion all amped up with power chords that will transport you back to a mythical smoky pub with brawling songs of drink, hard living and hard loving. Under the influence of old school punk rock and traditional Celtic tunes, the McGillicuddys sound like a psycho ceilidh amped up with power chords: drums, bass and electric guitar provide a thumping background for the lashings of mandolin, tin whistle and accordion that complete the glorious din. This heady mixture is topped off with the gritty real-life lyrics, and catchy boot-stomping songs that make up the full-bodied McGillicuddys experience: psycho ceilidh punk! From Victoria BC, on the west coast of Canada, the McGillicuddys are a stiff mix of the Pogues and the Clash, with shots of Social Distortion and the Dubliners thrown in for good measure, creating a sound fans of groups like Flogging Molly, the Mahones and Dropkick Murphys will happily drink to. The McGillicuddys new full length CD, aptly entitled “Sin Lane,” was released in March 2011. This 12 (actually, 13 if you’re counting) track CD features original songs written and inspired by the McGillicuddys’ 12 years of playing music and touring together, and offers a glimpse into the misadventures, sin and debauchery traversed along the way. Together with McGillicuddys’ original compositions, “Sin Lane” also includes a ‘McGillified‘ punk rock interpretation of the traditional tune The Banks of the Roses, and covers of Richard Thompson’s 1952 Vincent Black Lightning, and The Nips’ Gabrielle. 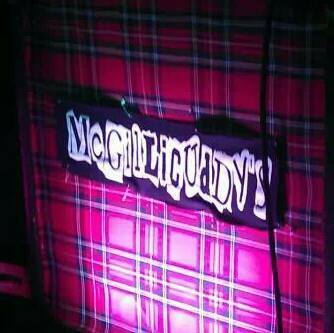 The McGillicuddys bring a high-energy Celtic punk rock ’n’ roll party to packed dance floors wherever they play. Their edgy arrangements and punk rock sensibilities appeal equally to both the alternative crowd, and to those who love traditional Celtic music.